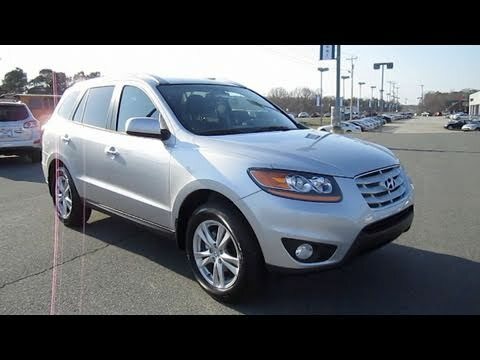 If getting the most for your money matters, the 2011 Hyundai Santa Fe might be the SUV for you. The Korean manufacturers have improved quality over the years but still have to entice buyers with good value and an excellent warranty - the Santa Fe has both. I love my Santa Fe. It is my first SUV. I love sitting higher off the ground. I feel much safer on the roads. I love the size. Not too big and not too small for family of 4. I love that the seats in back fold down if I have to move furniture etc. I love the roomy trunk and love the storage bins under the trunk and that they are hidden. I love my heated seats in the winter and love my moonroof and sunroof in the summer. The main thing I do not like is when backing up it is hard to see out back window. For awhile my car wouldn't always start each time. I figured out I had to wiggle the transmission stick and then it would start. Then after a few recalls it finally was resolved. The uneasiness of not knowing when that would happen was stressful but I just love this car so much. 2011 Hyundai Santa Fe - has a lot of little problems. From the moment I bought this vehicle, things started to go wrong with it. Granted, there haven't been any major issues, but a lot of little annoying ones. The blower motor on the heater makes a fairly quiet squeal when it is on, part of the front suspension went bad and was making a loud clunk every time I hit a bump, the rear brakes and rotors needed to be replaced, & there is moisture inside one of the tail lights. Not so bad, except I have only had the vehicle for a few months. Perfect for a small family. Has great trunk space and rides nice around town. My car has been reliable for my family. Its had very few problems at 90, 000 miles on it. The gas mileage is average with 14 gallons in the tank. The trunk is a good size to pack many things in. It also has a small compartment under the floorboard. The back seats are snug for 2 people to sit in and with 2 booster seats it doesn't leave much room for kids to have space to put their things in. I like the Bluetooth feature and hands free to talk on the phone. HYUNDAI IS RECALLING CERTAIN MODEL YEAR 2011 SANTA FE VEHICLES MANUFACTURED FROM SEPTEMBER 28, 2010, THROUGH NOVEMBER 25, 2010. SOME OF THE REAR BRAKE CALIPERS MAY NOT HAVE BEEN PROPERLY MACHINED. AS A RESULT, BRAKE FLUID WILL LEAK, FOLLOWED BY ILLUMINATION OF THE MALFUNCTION INDICATOR LIGHT INDICATING THE BRAKE FLUID LEVEL IS LOW AND SHOULD BE CHECKED, THEN A SOFT OR SPONGY BRAKE PEDAL FEEL, AND IF NOT SERVICED, REDUCED BRAKING POWER WHICH COULD INCREASE THE RISK OF A CRASH. DEALERS WILL INSPECT THE REAR CALIPERS AND REPLACE IT IF NECESSARY FREE OF CHARGE. THE MANUFACTURER HAS NOT YET PROVIDED AN OWNER NOTIFICATION SCHEDULE. OWNERS MAY CONTACT HYUNDAI ROADSIDE ASSISTANCE AT 1-800-243-7766. CURT MANUFACTURING IS RECALLING CERTAIN TOW PACKAGE WIRING HARNESSES, PART NUMBER 55538, THAT CONNECT TOW VEHICLE LIGHTING CIRCUITS TO TRAILER LIGHTING CIRCUITS SOLD FOR USE ON CERTAIN MODEL YEAR 2009 THROUGH 2011 HYUNDAI SANTA FE VEHICLES. THE UNITS ARE NOT WATER-TIGHT AND MOISTURE CAN SEEP INTO THE CONVERTER MODULE AND DEFEAT THE MODULE'S INTERNAL CIRCUIT PROTECTION. WITHOUT THE CIRCUIT PROTECTION, THE MODULE CAN OVERHEAT POSSIBLY RESULTING IN A FIRE. CURT MANUFACTURING WILL NOTIFY OWNERS AND REPLACE THE TOW PACKAGE WIRING HARNESS. THE REMEDY WILL BE PERFORMED FREE OF CHARGE. THE SAFETY RECALL IS EXPECTED TO BEGIN DURING OCTOBER 2011. OWNERS MAY CONTACT CURT MANUFACTURING AT 1-715 831-8713.